Streaming local files from our music iMac via PureMusic simply meant setting the Metis controller to input 10. 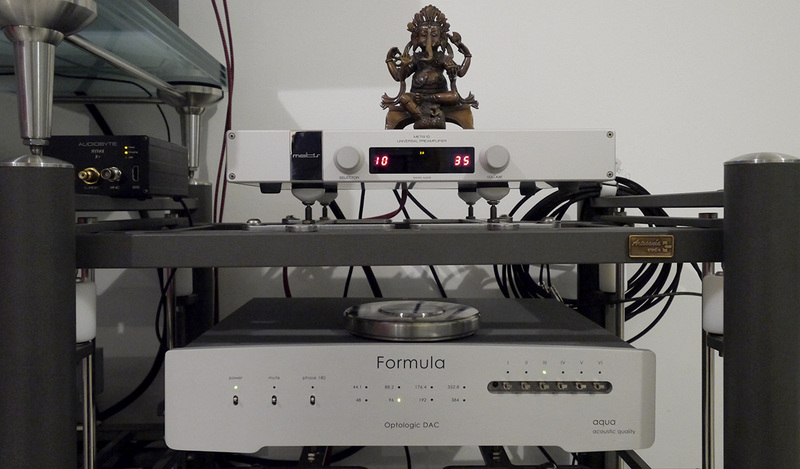 To loop in the Zu sub, a short S/PDIF cable linked one Metis LF output to our Aqua Formula DAC whose RCA outputs drove the subwoofer via a long interconnect. With one of Goldmund's own subs, the external D/A converter would have been redundant of course. The iMac's sound panel recognized the Metis 10 as not Goldmund but generic USB audio codec with a 48kHz sample-rate limit. Meanwhile the Formula DAC identified the signal received from the Metis as 96kHz like shown. The refusal of this CHF12'125 digital preamp to process anything higher than CD/DVD resolution says another cheery hello at a lifestyle not geek audience. The Metis 10 display can't be dimmed or extinguished. Bypassing its internal filter for a quick check, the Zu sub clearly received a full-range not low-passed signal to have me set its controls as per usual. Whilst the monitors sounded just as full-bodied and rich in this nearly 100m² pace as they had in the media room—translation: no tipping or lightening of their tonal balance—filling out the bottom 1.5 octaves worked a treat to scale up the sonic panorama even more. An actual not temporary install would remove everything between the speakers except the subwoofer. None of the external amps were in use. That's less clutter and a smaller hifi foot print in the living room. Ditto the sidewall rack. A full Goldmund system would only use the iMac and digital controller. The rest of it would be gone. No more audio shrine. Again, this was big generously fleshy earthy sound, not pixilated edge-limned hyper rez or wispiness with airy notions. In fact, all of it felt distinctly déjà vu relative to my 2014 review encounter with Goldmund's bigger ProLogos in our former mountain flat in CH. Unlike certain valve gear catalogues where every model sounds different to cater to a variety of ideals, this suggested a locked-in aural aesthetic regardless of model size or budget. Put differently, Goldmund's engineers didn't seem of two or more minds about what their ideal sound is. They could clearly get at it from any number of ingredients and directions. It's the perfect lead-in for an invisible guarantee. As long as you see eye to eye with their sonic gestalt, the Metis MkII are a sure thing. The sound-influencing parameters are all built in, hence predetermined. You can't miss. The one proviso? Don't go wireless and rely on the lossy iTunes volume control unless you fancy some glare and grain. Going uncabled really was child's play. Plug in the dongle, set your computer's output to Goldmund wireless and full attenuation. Hit 'play'. Gently ramp up the attenuator. Learn what equates to regular room levels. You might find that if you use iTunes, for much listening its volume bar could be shorter than 25%. Enough said. It works but more awaits. At lower levels, Goldmund's own digital attenuator was far superior! The little yellow LED confirms power status. The hard mains rocker can power the speaker down if you prefer that over standby. Where does a Goldmund Wireless Metis MkII monitor leave your typical reviewer? Awaiting retirement is what. It's only then that traditional hifi separates may finally be left behind to embrace the fully active DSP'd future that's here today and has been for years already. With Goldmund, one buys into luxury branding, more than three decades of consistent R&D and accumulated knowledge which hides behind deceptively plain facades. This company wants the user experience to be so simple that even granny could work it. Sliders, dials, dip switches, adjustable filter freqs, multi-tiered menus accessed by smartphone and such are for competitors. Goldmund's ideal client has no desire to learn Audiophileeze; to monkey around with digital filters; to worry about DXD, DSD, MQA and other acronyms. It's back to pure enjoyment without having to understand how it all works; or why it doesn't. You won't even install drivers. To the technically inclined who'd belittle such an approach as fit only for newbs, I would simply say from experience that the bandwidth of extra enjoyment—from high-resolution files and such—pales compared to what actually achieving Goldmund's masterfully set analogue sound means. Since the advent of recorded sound, generations of people have fallen in love with music via the radio, LP, cassette and CD. Do we really believe their pleasure was any less because it didn't include 32/705.6kHz or quad DSD? Sometimes less complicated really is better. It's certainly less fussy. In closing, active speakers can be easily obtained from the professional sector; and for pennies on the Goldmund Swiss franc. The arguably key advantage today's Metis have over their types is knowing that a measured flat response is not what sounds best in a consumer's sweet spot rather than recording engineer's seat. A ruler-flat response only looks good on the scope. Yet it's what pro monitors must go after by design. Goldmund's need not and do not. 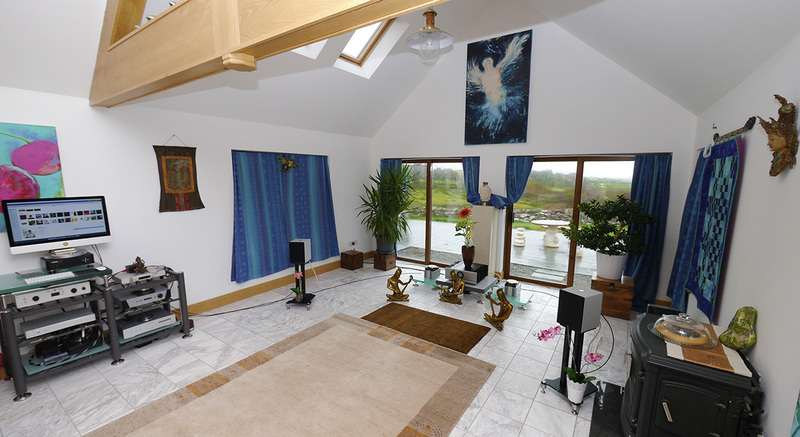 Theirs are strategically EQ'd to respect psychoacoustics and how a speaker behaves not in the nearfield of a recording console but in a standard living space. Even though required deviations from perfectly flat aren't big, knowing what they should be and locking them in tends to remain a mystery and elusive target to most audiophiles who are addicted to the Russian roulette of freestyle mix'n'match. A second advantage the Metis owns is truly superior amplification identical to Goldmund's standalone amplifiers. Combined, such code writing skills and circuit chops net a fundamentally satisfying very 'calorific' sound without tubes, class A heat or other complications. While it admittedly all looks rather cute or plain, reads basic perhaps simplistic even and costs very grown-up money... the results are in fact very advanced. And that's the reason why a properly liquid buyer ought to consider these heavyweight little bundles of joy over a multitude of far more complex far bigger far less sure things. Switzerland isn't just for fancy watches after all; and style and substance aren't mutually exclusive. Time out!